Professor Wiener in the MIT classroom with the tricycle cart, LIFE magazine. 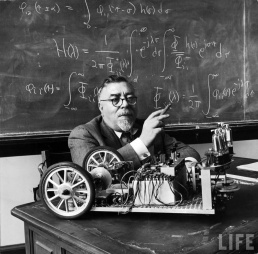 Norbert Wiener (November 26, 1894 – March 18, 1964) was an American mathematician and philosopher. He was Professor of Mathematics at MIT. Wiener is considered the father of cybernetics, a formalization of the notion of feedback, with implications for engineering, systems control, computer science, biology, philosophy, and the organization of society. Born on the doorstep of the twentieth century, Norbert Wiener was a descendant of Eastern European rabbis, scholars, and, purportedly, of the medieval Jewish philosopher Moses Maimonides. He entered college at eleven, received his Ph.D. from Harvard at eighteen, apprenticed with renowned European mathematicians, and, in 1919, joined the faculty at the Massachusetts Institute of Technology. His early mathematical work solved practical problems in electronics theory that engineers had been wrestling with for decades. In the 1920s, he worked on the design of the first modern computer, and during World War II, he helped create the first intelligent automated machines. Wiener's wartime vision grew into a new interdisciplinary science of communication, computation, and automatic control, spanning the forefronts of engineering, biology, and the social sciences. His ideas attracted an eclectic group of scientists and scholars: computer pioneer John von Neumann, information theorist Claude Shannon, and anthropologists Margaret Mead and Gregory Bateson. 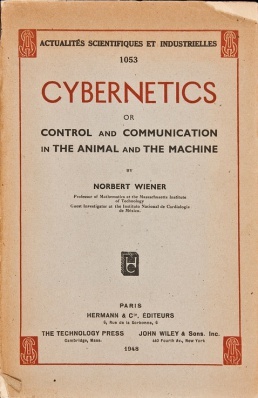 Wiener named his new science "cybernetics"—from the Greek word for steersman. His 1948 book Cybernetics: Or Control and Communication in the Animal and the Machine set off a scientific and technological revolution. In less than a decade, cybernetics transformed the day-to-day labors of workers in every industry and unleashed a flood of dazzling devices on postwar society. Wiener gave the word "feedback" its modern meaning and introduced it into popular parlance. He was the first to perceive the essence of the new stuff called "information." He worked with eminent biologists and neurophysiologists to crack the communication codes of the human nervous system, and with the engineers who incorporated those codes into the circuits of the first programmable "electronic brains." Wiener spoke and wrote passionately about rising threats to human values, freedoms, and spirituality that were still decades in the offing. His efforts won him the National Book Award and the National Medal of Science, the nation's highest scientific award. Yet, even as his new ideas were taking hold in America and worldwide, Wiener's visionary science was foundering. By the late 1950s, cybernetics was being superseded by the specialized technical fields and subdisciplines it had spawned, and Wiener himself wound up on the sidelines of his own revolution. his moral stands were rejected by his peers and a gadget-happy consumer public, and his grim predictions were dismissed by many as the doomsaying ofan aging, eccentric egghead. He died suddenly, at age 69, on a trip to Europe in 1964, even as so many of the things he had predicted were coming to pass. The Fourier Integral and Certain of Its Applications, New York: Dover, 1933. Cybernetics: or Control and Communication in the Animal and the Machine, 1948, Log. The Extrapolation, Interpolation, and Smoothing of Stationary Time Series with Engineering Applications, Cambridge, MA: Technology Press, 1949; New York: John Wiley & Sons, 1949; London: Chapman & Hill, 1949; 2nd ed., MIT Press, 1966. Earlier printed as a classified NDRC "yellow peril" Report, MIT, 1942. Uses Gauss's method of shaping the characteristic of a detector to allow for the maximal recognition of signals in the presence of noise; later known as the "Wiener filter." Reviews: Tukey (1952). The Human Use of Human Beings, 1950, Log. 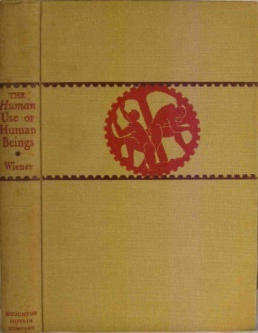 The Human Use of Human Beings: Cybernetics and Society, Boston, MA: Houghton Mifflin, 1950; 2nd ed., 1954; London: Eyre and Spottiswode, 1954; New York: Avon Books, 1967; New York: Da Capo Press, 1988; London: Free Association Books, 1989; new ed., 1990. Time and Organization (Second Fawley Foundation Lecture), University of Southampton, 1955. The Theory of Prediction: Modern Mathematics for the Engineer, ed. E. F. Beckenbach, New York: McGraw-Hill, 1956. Nonlinear Problems in Random Theory, MIT Press and Wiley, 1958. The Tempter, New York: Random House, 1959. Time Series, MIT Press, 1964. Trans. of "Sur la théorie de la prévision statistique et du filtrage des ondes, Analyse Harmonique", Colloques Internationaux du CNRS 15, Paris: Centre National de la Recherche Scientifique, 1949, pp 67-74. God and Golem, Inc.: A Comment on Certain Points where Cybernetics Impinges on Religion, MIT Press, 1964.
editor, with J. P. Schadé, The Cybernetics of the Nervous System, Elsevier, 1965, 425 pp, PDF. Invention: The Care and Feeding of Ideas, intro. Steve Joshua Heims, MIT Press, 1993, 185 pp. Ex-Prodigy: My Childhood and Youth, MIT Press, 1953; New York: Simon and Schuster, 1953. I Am a Mathematician: The Later Life of a Prodigy, Garden City, NY: Doubleday, 1956; MIT Press, 1964. Selected Papers of Norbert Wiener, Expository papers by Y. W. Lee, Norman Levinson, and W. T. Martin, MIT Press & SIAM, 1964. "Bibliography of Norbert Wiener", Bull. Amer. Math. Soc. 72:1, Part 2 (1966), pp 135-145. P. R. Masani, Norbert Wiener 1894–1964, Birkhäuser Basel, 1990, PDF. Flo Conway and Jim Siegelman, Dark hero of the information age: in search of Norbert Wiener the father of cybernetics, New York: Basic Books, 2005, PDF. This page was last modified on 16 March 2018, at 10:39.